Click on an image below to personalize. You can choose from 4 icons. Get in the Halloween spirit with this bright and colorful style. Available in four vivid Halloween hues, this style features a variety of background patterns and the option to incorporate small Halloween icons. Complete your design with either a pumpkin, bat, ghost or witch hat. 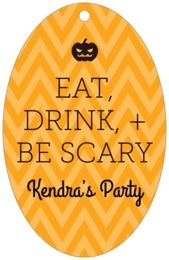 Customize your Iconic Halloween party tags today to add a unique, stylish touch to your event! 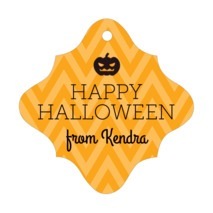 Iconic Halloween party tags are printed on extra-thick cover weight white paper and come in a variety of shapes and sizes (including square, circle, a scallop-edged circle, ovals, and other more intricate shapes). Party tags come pre-punched and have a small round hole to thread your choice of tying material. And they come packaged as a set in small bags. 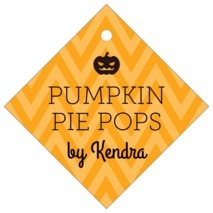 Select a shape and color above to begin customizing your Iconic Halloween party tags today!